by Brendan Byrne . Liturgical Press, 2000. Here professor and author Brendon Byrne explores and discusses God’s hospitality through the lens of the Gospel of Luke. Byrne covers the entirety of Luke’s gospel, and the chapters coincide with the sequence of scripture. 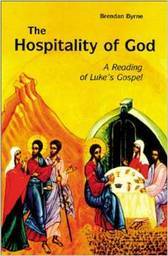 However, more attention is given to some sections that Byrne finds particularly illuminating for understanding God’s hospitality. These stories include the Good Samaritan, the Prodigal Son, Zacchaeus, and the Walk to Emmaus. Byrne’s conclusion is sixteen brief statements on the idea of salvation in the Gospel of Luke. A bibliography and three indices (scripture, author, and subject) round out the book. Byrne writes from within the Roman Catholic Jesuit tradition, yet the breadth and depth of Byrne’s scholarship makes this book a valuable resource for pastors and anyone else serious about exploring the Gospel of Luke or its relationship to the theme of God’s hospitality.